Cristiano Ronaldo missed a second-half penalty on his record-breaking 128th cap as Portugal were denied of a victory by Austria at the Parc des Princes. After a first-half which was all one-way traffic from Portugal barring David Alaba's dangerous free-kick which required a heroic clearance, an evenly matched second half would present a huge opportunity for Ronaldo, who stepped up to take a penalty. But with the keeper diving the other way, it struck the left post and came back out, with the rest of the game resulting in more close calls but nothing enough to sway the game in favour of Portugal while Austria marched to their first cleansheet in 14 major tournament matches. Cristiano Ronaldo was all smiles in the pre-game buildup with a riveting rendition of the Portugese anthem. When he and his teammates did eventually take to the pitch after the sounding of Nicola Rizzoli's whistle, there was plenty more to grin about as his nation started on the front foot. Other than a mightily close chance that saw Martin Harnik head wide after Sabitzer picked him out with a wonderful cross, Fernando Santos' side made it uncomfortable for the Austrians. After a series of corners, Carvalho smashed over, just after Ronaldo was probing near the far post. Having refereed the 2014 World Cup Final, the referee's CV spoke for itself. He laid down the law early after successive challenges by Pepe and Carvalho were deemed excessive. They wouldn't have much work to do early on, instead it was their counterparts under heavy fire. Nani was denied by some Robert Almer heroics in what sparked the beginning of an intense period for the keeper. The winger managed to surge into the box and place it on his right foot, but the attempt to slot it past was thwarted. Veirinha then had a stab from long range and was stopped. His opposing number Rui Patrício had little reason to be nervy, although he certainly seemed it when a clearance under pressure was blasted straight into his own defender and a corner was conceded. No danger would follow for the time being. 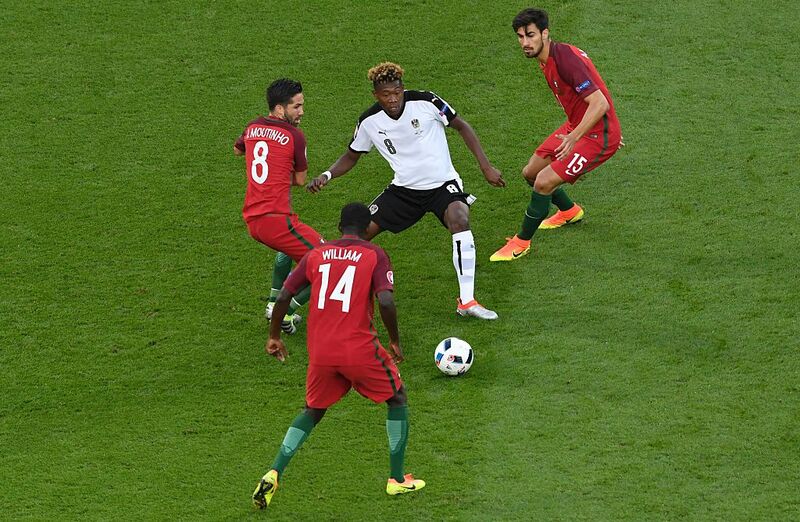 For all that chance making, it was David Alaba who created the biggest pulse-raising moment of the game so far. A set-piece from just outside the area, close to the right near the byline sparked all sorts of troubles for Portugal. He curled it in menacingly towards the far corner where Vierinha was there to head it out in a goal-saving clearance. Other than that attempt, it was a quiet game for the Austrian who departed after the hour mark. With 45 minutes of football in the books at the Parc des Princes, another goalless interval was nothing new in the tournament, with Austria doing well to calm the storm that Portugal brought with an ample neutralisation effort. A strong save by Patricio stopped them from going one better as Ilsanker drove it from far out. Ronaldo was still waiting for the free-kick magic to descend upon him, but it wouldn't come in the early goings of the second half. His first long-range attempt was hit straight at the wall, while the second fizzed over the target. That grin which was so evident earlier began to recede as Portugal were looming in curiosity as to where the goal was coming from. The biggest star on the pitch tested Almer with his first decent chance of the game, a venomous strike from outside the box which was tipped away by the keeper. With Austria tuning up the band in an attempt to stun the Portugese, more was being asked of both sides. However, Portugal were then handed a golden opportunity with a penalty late in the half. And no better man to step up than Ronaldo, making a record breaking appearance. But with the keeper diving right, he drove it to the left but it struck the woodwork; as Portugal were denied of the game winner. Ronaldo was distraught; but those emotions would ramp up when he headed it into the back of the net, only to be deemed offside. Austria resolutely denied any further attempts, just about clearing away as Silva tried to breach into the box, while balls in towards Eder were not knocked on. 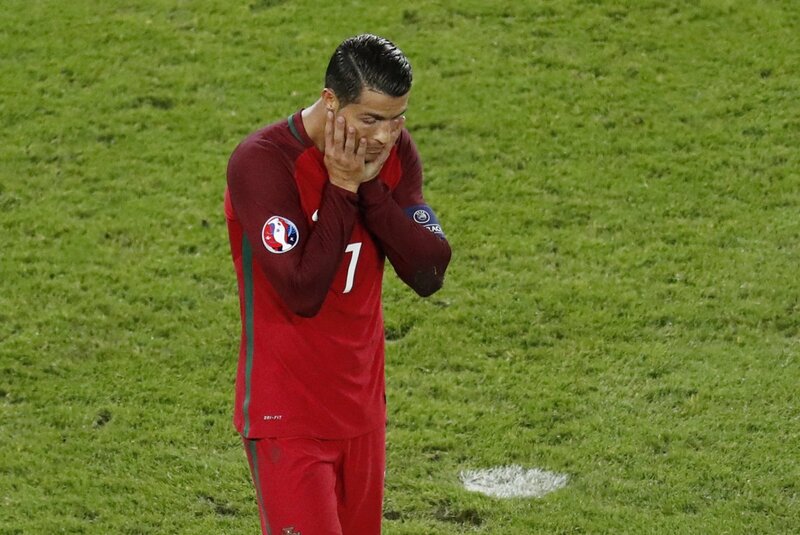 Portugal's desperation would continue as the final whistle was blown.